“Tuberculosis (TB) is a major contributor to morbidity and mortality in children living with HIV (CLHIV), particularly in TB endemic settings. TB in CLHIV is a preventable and treatable disease. 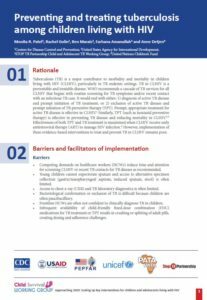 WHO recommends a cascade of TB services for all CLHIV that begins with routine screening for TB symptoms and/or recent contact with an infectious TB case. It would end with either; 1) diagnosis of active TB disease and prompt initiation of TB treatment, or 2) exclusion of active TB disease and prompt initiation of TB preventive therapy (TPT). Prompt, appropriate treatment for active TB disease is effective in CLHIV.